A look at ICANN’s growing expenses. So far I’ve reviewed ICANN’s swelling expenses at a high level as well as the massive headcount growth at the non-profit domain industry overseer. Now let’s dig a little deeper to look at the costs and how they are growing. This chart should say a thousand words. There’s a slow and steady increase in expenses over time. Then there’s a huge bump in everything in 2013, surely due to new top level domains. Professional services costs drop after the initial onslaught of new TLD work but continue to be 2x what they were before new TLD applications. Personnel and Administration continue their upward march even after the initial surge of new TLD work is done. Travel continues to be a major expense at $19 million last fiscal year. In my next post I’ll summarize what I think has gone wrong and what should be done about it. 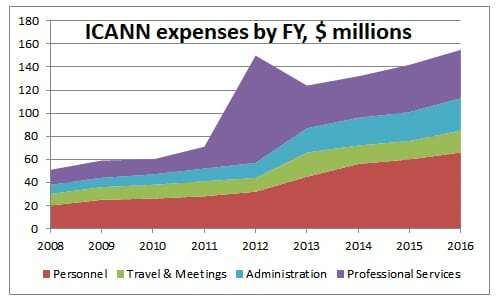 Employment at ICANN has exploded along with the non-profit’s expenses. Yesterday I reviewed the massive growth in ICANN’s expenses over the past 9 years. Today I’ll examine growth in headcount. ICANN records the total number of W-2 employees on its tax returns, but these numbers are based on calendar years instead of financial years. 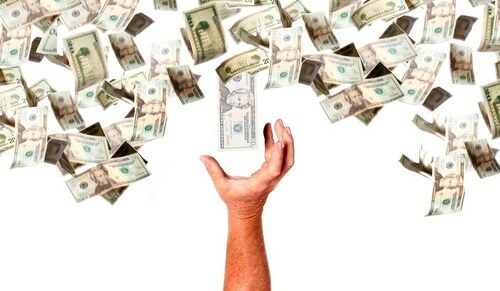 ICANN’s financial year ends in June. 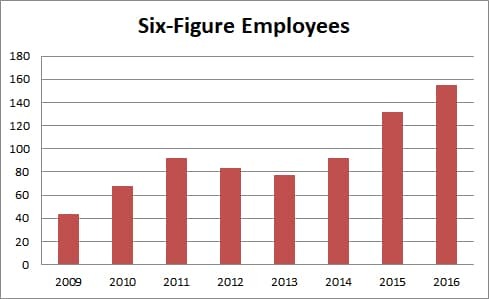 The number of six-figure employees has also grown. The chart below shows the number of employees reported on the tax return as earning $100k or more in reportable income. I believe these numbers are based on the end of the calendar year, so data from FY 2016 is actually from December 2015. I also understand that this data does not include non-reportable income, such as the generous contribution ICANN makes to employee’s 401(k) plans. The FY 2016 tax return lists 14 employees who had total compensation (including 401k contributions and non-taxable income) of $400,000 or more. The tax returns also include the number of contractors paid $100,000 or more each year. This data is from FY 2009- FY 2016 as reported on tax returns. The information was missing on the FY 2013 return. 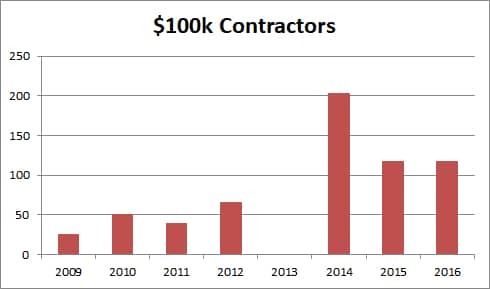 I suspect contractor numbers were high in 2013 due to new TLDs. A look at data behind ICANN’s growth and ensuing budget crunch. ICANN is in a bit of a budget crunch. Lower than expected revenues along with a re-evaluation of the required reserve fund (and tapping into it) are straining the organization. 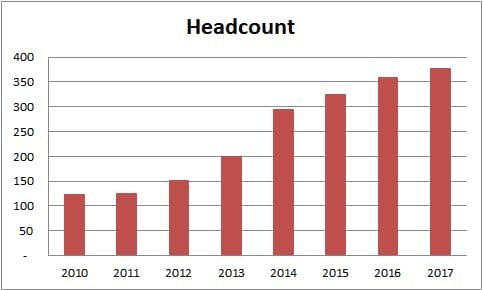 I have plenty of thoughts on how this happened and what to do about it, but I’m going to start with a series of charts showing the size of ICANN over the past 7-8 years. Let’s start by looking at the non-profit’s expenses over the years. Note that ICANN’s fiscal year ends in June. For example, its 2016 financial year ended June 2016, and data from that year was reported on its 2015 tax return. 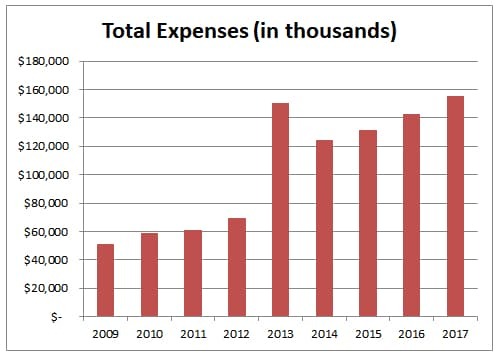 This chart shows total expenses for FY 2009 to FY 2017. Data is taken from tax returns except for 2017, which is taken from audited financial statements. And this is where things get interesting. In the next year, FY 2014, ICANN’s allocated expenses for new TLDs dropped by $50 million but its overall expenses fell by only $26 million. 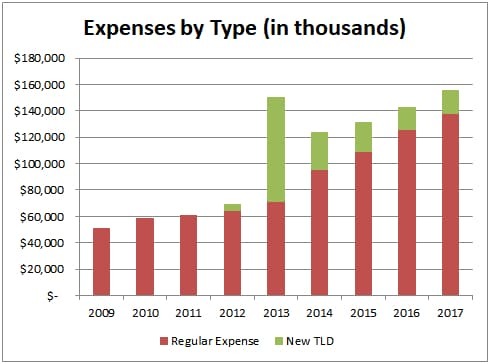 Here’s a stacked chart showing each year’s expenses divided between regular and new TLD. In my next post, we’ll look at headcount at the organization. …and that doesn’t include new TLD costs. ICANN’s latest proposed budget segments out the core ICANN functions and the new top level domain program. But even its core functions budget are slated to grow by nearly $12 million next financial year compared to what it expects to spend in the current year (FY 12). Here’s why. This increase is basically due to community requests. It includes more money for travel/sponsorship, meetings, etc. Keep in mind this is on top of added expenses at ICANN meetings for language services. – $0.8M in travel, outside providers and equipment to enhance its multilingual programs. I’d really like to see that office. Of course this is just part of the budget difference. See more in the full draft budget.